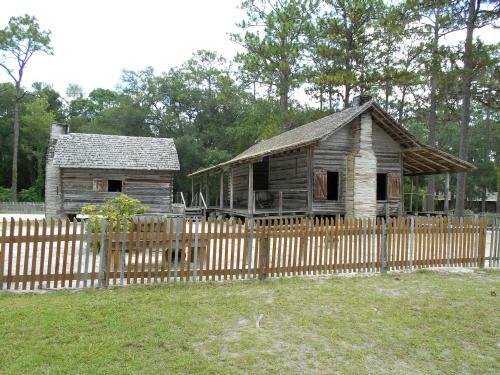 The Forest Capital Museum State Park occupies 13 acres just south of Perry Florida. The property, which originally was the ancestral homestead of Florida senator Pete Gibson, was donated to the State in 1972. The property includes the original "cracker" cabin built in 1863 which is open to the public. The State Park also includes a museum and interpretive center, picnic area and playground. The museum features exhibits that show the history forestry of the forest industry in Florida. It includes a detailed look at native long-leaf pines, and many of the products that were made from them. Displays show how turpentine is extracted from the trees and distilled. Forest ecology and small animal exhibits are also available. One of the highlights of the museum is a carved wood map of Florida with each of the State's 67 counties being made of wood native to that area. The old cracker homestead includes an authentic cabin and outbuildings complete with period furnishings dating to the late 1800's. A vegetable garden is planted each spring, and demonstrations of sugar cane production and syrup-making are done seasonally. Forest Capital Museum State Park also has several short nature trails around the grounds. Restrooms and a children's playground are centrally located in the picnic area that includes three covered pavilions than can seat up to 60 people. The pavilions are available for rental for parties or family get-togethers. The Park is also a popular place for weddings.